How Do the Differential & Transfer Case Work Together? Vehicles are equipped with at least one differential and some also have a transfer case. Each need to work efficiently in order transfer torque from the transmission to the wheels. A four-wheel drive (4WD) and an all-wheel drive (AWD) vehicle, however, needs a transfer case in addition to differentials on each axle. While both operate similarly, there is a difference between transfer case and differential. We’ll explain what the transfer case is and differentials and how to identify a bad transfer case and bad differential symptoms. As part of the front and/or rear axle assembly, the differential is designed to drive wheels while allowing them to rotate at different speeds when turning by providing proportional RPMs between the left and right wheels. The power from both the engine and transmission is directed through the differential and out to the wheels. 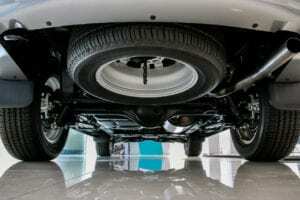 The transfer case is located between the transmission and front and rear differentials via the driveshafts, creating a two-wheel drive (2WD) or four-wheel drive vehicle. On a four-wheel or all-wheel drive (AWD) vehicle, it directs power to two or four wheels. When the transfer case engages the front shaft, which feeds power to the front wheels, the vehicle then becomes a four-wheel drive. All-wheel drive vehicles receive power through the transfer case at all times. Each vehicle has a different setup. Pick-up trucks have two-wheel and four-wheel drive options, some crossovers have an option of all-wheel or two-wheel driver, while some SUVs have an option of all-wheel drive. Performance vehicles also are available in 2-wheel or all-wheel drives. Four-wheel and all-wheel drive options offer better traction and maneuverability for steep roads, mountainous terrain, and slick roads from inclement weather. What Is the Purpose of a Transfer Case? Vehicles equipped with a transfer case (4WD & AWD) fare better on slippery surfaces, giving them the ability to accelerate more efficiently. When purchasing a vehicle, it’s important to ask yourself if you’ll be traveling with your vehicle on snowy, wet, sandy, or rocky roads. If so, considering a vehicle with four-wheel or all-wheel drives may be right for you. Four-wheel drive and all-wheel drive vehicles are ideal for off-roading and the needed traction with adverse weather conditions. Transaxle oils, differential fluid, and gear oils should be changed between 30,000 – 60,000 miles by a certified technician. Clean, fresh oil provides better protection of the differential and well-lubricated parts, as with any component on the vehicle, ensure the best performance. Transfer case fluid should be replaced every 30,000 miles to remove any debris or contaminants and to better lubricate components. This is highly recommended for trucks that tow loads and utilize four-wheel drive frequently. Whirring or whining noises when decelerating. A howl or whine during acceleration over high or low speeds. Rumbling or whirring at speeds over 20 miles per hour, but changes while turning. Frequent clunking sound every few feet or when starting to move. Vibration that increases with speed. Your transfer case will need to be inspected as well if you’re unable to or have trouble switching from two-wheel drive to four-wheel drive or the vehicle shudders when turning. Neglecting any maintenance service on your vehicle is unwise in any situation. Spent differential fluid, after time, becomes dirty and contaminated. Continuing to drive with unclean fluid is risky as it may result in undue wear on components leading to permanent damage. Avoiding maintenance on the transfer case may impair the vehicle’s ability to convert to four-wheel drive. Drivers should take extreme caution if they are experiencing trouble with the transfer case and avoid rough or slippery terrains. Since vehicles cannot function without the differential, it’s important to have your car, truck, or SUV inspected and have the differential fluid changed as recommended by the manufacturer. Regular maintenance on your vehicle ensures a longer life for your car and a better performance. To discuss your vehicle’s maintenance schedule, contact a friendly Sun Devil Auto Service Consultant today. We’re happy to answer your questions and develop a cost-effective way for you to maintain your vehicle bumper to bumper.